A casual building game that looks and plays like the love child of Sim City and Build-A-Lot, Virtual City offers quite a punch in a very condensed form. The point of the game isn’t immediately obvious from the very disconnected opening movie, but you quickly learn that you’ve inherited a massive shipping and building company, and now you’re responsible for overseeing a number of major construction and trade projects all around the country. The learning curve for Virtual City is surprisingly intense for such a casual game, but the initial tutorial levels do their best to ease you into it gently. Essentially, every level comes with some specific, stated goals. Many of those goals have to do with establishing truck routes and shuttling goods to and fro between locations, but there are often times when you’re called upon to improve a city’s happiness, increase the population, address environmental concerns; you get the picture. The urban planning portion is rather more complicated than just buying a truck and sending it on its merry way. 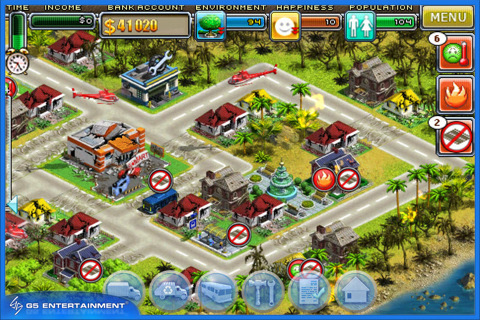 There are a number of building plans to acquire throughout the game, and you can build and upgrade specific buildings to help you reach your goals. Often you start out with key components already in place, but you’ll need to build additional buildings to get everything done. For example, you might need to construct an oil derrick to help fuel a needed paint factory or build a movie theater when your population gets too unhappy at the industrial wasteland you’ve surrounded them with. Once you get going, there are a lot of moving parts to keep track of, and efficiency and balance are the keys to success in this crazy Virtual City. As complicated and wild as the action gets, the game stays quite fun above all. I mentioned earlier that the learning curve is a little intense, but for the most part, it gets much easier once you’ve learned to recognize the various building types. Visually, the game has a strong Sim City vibe, which isn’t a bad thing in my book, but there is a rather complicated system of icon shorthand that you’ll need to master to succeed. The small screen can make it tough at times to hit the right thing, and I found myself squinting a little on my 3GS, but the game is Retina optimized, which gives you iPhone 4 users an advantage. The campaign levels were breezy and fun, but their replay value is fairly limited. There’s a promised sandbox mode that has been hotly anticipated, but it doesn’t seem to have made an appearance yet, despite a prominent button for it right on the front screen. A sandbox mode would go a long way to making this a strong rival to the Sim City throne, but even now, Virtual City is an extraordinarily robust game that seriously defies the usual casual gaming conventions and criticisms. And if you’re still on the fence, there’s a Lite version available that is definitely worth a look. 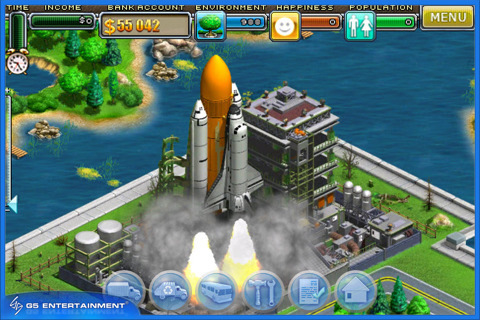 AppSafari review of Virtual City was written by Tracy Yonemoto on October 18th, 2010 and categorized under Action, App Store, Games, iPad apps, Puzzler, Resource Management, Strategy, Time Management. Page viewed 3704 times, 1 so far today. Need help on using these apps? Please read the Help Page.